The third chapter of Superman Reborn has some really amazing art, and an interesting story, although I am still far from clear as to what is going on. 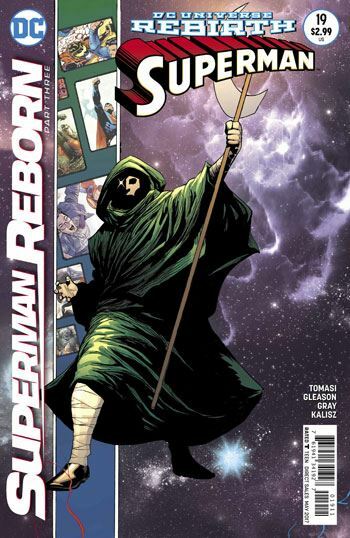 And despite being featured so prominently on the cover, the mystery man in the cloak with the scythe does not actually appear in this issue at all. 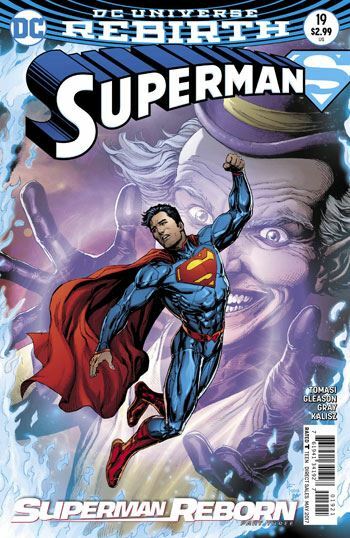 Mr. Mxyzptlk, back again following the revelations in the most recent issue of Action Comics, plays his evil, manipulative games with Superman and Jon Kent, doing his best to keep them apart. The story basically relates the battle the father and son have to find each other once more. More than anything, what makes this issue stand out is the art by Patrick Gleason and Mick Gray. The towering Infinite Planet is just wonderful, as is the board game spread. The artists make Mr. Mxyzptlk look both silly and frightening at the same time. Taking a guess at the larger picture (and I avoid all the internet spoilers, so I am genuinely guessing, I really don’t want to know ahead of time), it seems to me that Mr. Mxyzptlk is simply taking advantage of the larger reality warping events, to play his own games. This was basically the case with Abra Kadabra in the first story arc from the new Titans comic. There is, perhaps, one line in the story that holds a significant clue, and the last page features a surprising return. I wouldn’t have minded a bit more clarity, a bit more revelation, but the story arc has not ended, and things have been progressing very enjoyably. There is no reason to think that the next week’s issue of Action, in which Superman Reborn will conclude, will be anything other than satisfying.